The HS103 2-pack is the easiest way you can start controlling lamps, fans, and other smaller electronics. HS103P2 is a lighter version of our mini plug with all the features you expect from the TP-Link and Kasa family. The Kasa app also guides you through each step of the installation, connecting your smart plug to your home Wi-Fi. - Control your smart plug from anywhere with your smartphone using the Kasa app (IOS, Andriod). - Easily connect to Amazon Echo or Google Assistant voice assistants for convenient hands-free control. - Use Away Mode to switch connected devices, like lamps or fans, on and off at different times to give the appearance someone is home while you're away. - Set schedules to turn connected devices on and off at designated times. 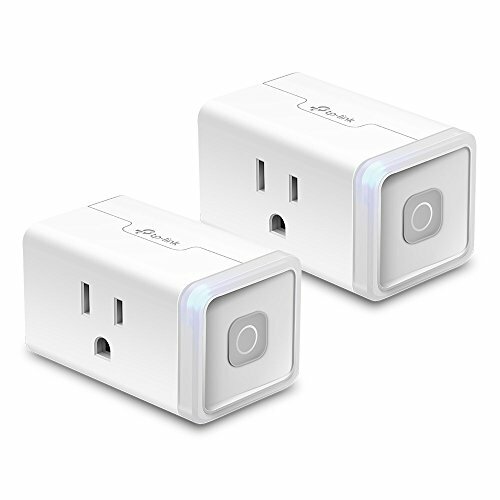 - Installation is easy with no hub required, just plug in and connect to secure home Wi-Fi network. In addition, the compact design doesn't block the second outlet. Enjoy the convenience of having a smarter home with the Kasa Smart HS103 2-Pack today. Requirements: Secure 2.4 GHz Wi-Fi Network required. Kasa App compatible with Android 4.1 or higher and iOS 9 or higher. PROGRAM SCHEDULES: Set schedules to turn connected devices on and off at designated times. If you have any questions about this product by TP-Link, contact us by completing and submitting the form below. If you are looking for a specif part number, please include it with your message.